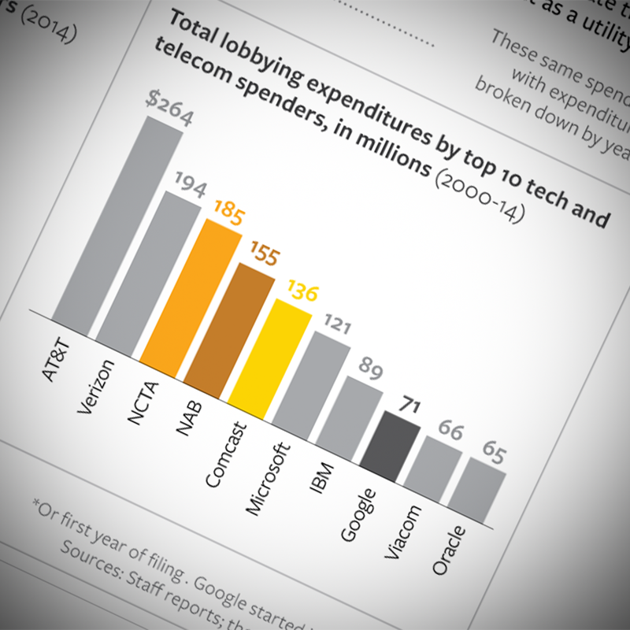 The top 10 tech and telecom lobby spenders paid out more than $125 million for lobbying in 2014. The tech and telecom industry has spent many millions on lobbying in the past decade, as watershed issues like SOPA/PIPA and net neutrality consumed the interest of telecom giants and dragged tech newcomers like Google and Facebook into the Washington influence scene. Once relatively disconnected from politics and lobbying, tech companies "learned to play the Washington lobbying game" in the 2000s, says Bill Allison, senior fellow at the Sunlight Foundation. Since then, the amount they spend in Washington has exploded, approaching the lobbying budgets of large, influential telecom associations like the National Association of Broadcasters and the National Cable and Telecommunications Association. And even after the Federal Communication Commission votes on net neutrality Thursday, the gears of the tech and telecom lobby machine won't stop churning. Issues like consumer privacy, cybersecurity, and an upcoming update of the telecom regulation legislation will keep lobbyists employed and busy.